Home Edu Events Arundhati Roy comes out of hibernation to speak about her ‘truth’. Arundhati Roy comes out of hibernation to speak about her ‘truth’. · Rajkamal Prakashan enter in it’s 70 years with Arundhati ‘Talk’. · Rajkamal Prakashan to publish books in Bhojpuri, Maithili and Urdu. 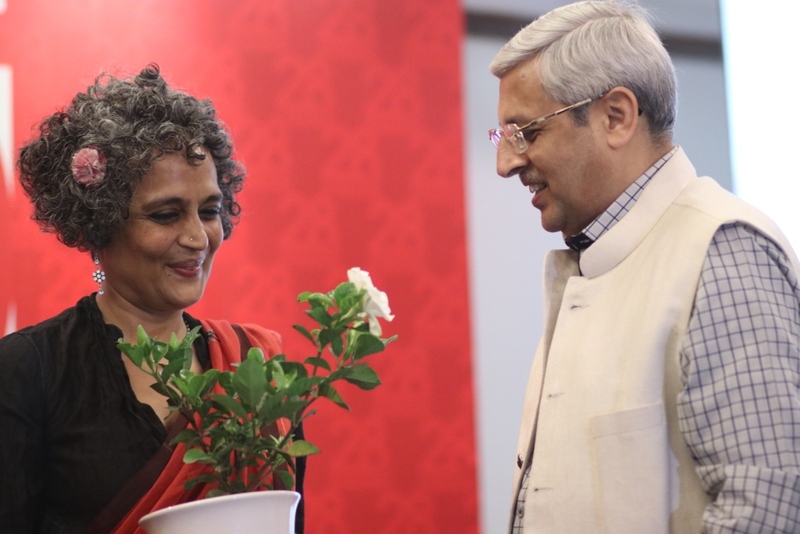 New Delhi.RajkamalPrakashanSamuh celebrated its 69th Foundation Day on 28th February, 2018, in a unique manner: A no-holds-barred conversation between Arundhati Roy,(best known for the 1997 Booker award-winning novel The God of Small Things) and professor and translator Alok Rai on Waqt Ki Aahat at Silver Oak, India Habitat Centre in New Delhi, had the gathering listen in rapt attention. RajkamalPrakashanSamuh, which has published five translations of her books in Hindi so far, and will also be publishing the Hindi and Urdu translations of her latest book The Ministry of Utmost Happiness, has laid out grand plans to usher in the 70th year of its successful establishment. Rai, who prepared the ground for Arundhuti Roy, introduced the session and spoke about the works that Roy has been doing ever since her first novel The God of Small Things became hugely successful. Roy, who has never shied away from speaking her mind, was her forthright best too, and spoke candidly about issues that are close to her heart. Rai explained how The Ministry of Utmost Happiness is different from her first book. “It’s because of the changing voices in the changing times that propel a writer in her to break away from her earlier voice and transform her narrative voice. Hence we have named our session ‘Waqt ki Aawaz,” he said. In the same breath, she added that she never defends what she writes. Her comment, “When you write, you should write like a suicide bomber,” was received with a thunderous applause. On this occasion he also remember Sheela Sandhu, who has been a great pillar of Rajkamal Prakashan. 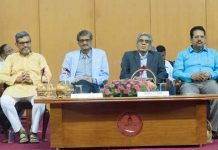 He also shared how proud they are on five of their authors in Bangla, Marathi, Gujarati and Hindi have won the Gyanpeeth Awrads in the past five years consecutively. Mr. Ashok Maheshwari has announced two new awards also. One will be given to a individual publisher for their work in Indian language and Second for best book Seller. On this occasion ‘Pathak Mitr Samman’ has been given to Rajkamal’s efficient employee Mr. Upendra Jha and Mr. Mukesh Kumar for their extraordinary performance. The one hour session was also followed by a question and answer round in which the audience asked Roy some tough questions. Previous articleMr. Rangarajan Raghavan appointed as Managing Director of HCL Infosystems Ltd.